Bali Custom Made Tour are recommendation directly from our guests named Gian Maria Barosio gianmaria.barosio@gmail.com. This tour option is very compact, because by choosing this program, you can directly to see the nature and culture of Bali as a whole in one day. Highlight : Traditional Baha Village, Pacung, Wanagiri (Monkey Forest), Munduk Waterfall, Lake Beratan, Candi Kuning Market, Jati Luwih and Sunset at Tanah Lot. Price: IDR. 500.000/person Min. 2 peolple Included : AC Coach, Petrol, Entrance Fee, Drive Guide. Our guests stay at the Suly Resort and SPA. We left the resort and SPA Suly at 09:00 am, heading straight Wanagiri. Following the road winding up the hill, through groups of monkeys on the road sides, we will arrive at the junction on the top of the hill, in this junction take the left turn ( the straight direction go toward Singaraja city of north Bali ). Start from here to the west, we will see one of the most beautiful nature and vegetation scenery on the island. On this quiet scenic asphalt road, we will find green grass on the road sides, trees, plantations and farms on the right side of the road, the Lake, and disappear at below left of the road wile we are driving beside lush vegetation and big trees. 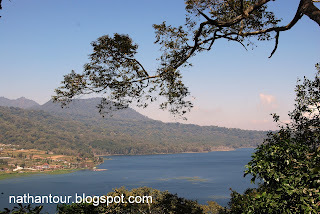 And then the tour, we continue to Munduk waterfall on the way we stopped for a moment to enjoy the beauty of the twin mountains that extends behind the fund Buyan and Tamblingan. The view was magnificent. After taking a few photos. Our trip continue to the Munduk waterfall. Arriving in the parking are at Munduk, we had to walk down the clove, coffee, chocolate and Vanilla plantation. By foot along the path within 15 minutes we finally arrived at the Munduk waterfall. Unusual sight they see. We saw some tourists bathe in the waterfall Munduk. Cold water gives a distinct impression. Once we felt quite enjoyed the scenic waterfall, we continue the journey toward Ngiring Wedang Restaurant. In Ngiring Wedang Restaurant we enjoy organic coffee. With views of the valley clove, Munduk village and paddy fields that can be seen from a distance took us feel above the clouds. It was an incredible sight. At that time the weather was sunny, so we could see the North Bali coast makes an unforgettable experience. Continue our journey towards the lake Beratan. Here we enjoyed the view of Ulun Danu Beratan Temple. This temple is one of the icons of Bali, because fractional currency 50 000 Indonesian Bank Note, the pictures taken at this place. These objects are very precisely when enjoyed in the afternoon. In view of the Ulundanu temple with backdrop a Puncak Mangu mountain. Continue our journey towards the yellow temple market. Here tourists can enjoy the scenery of spices, fresh vegetables, tropical flowers, rabbits, and various handicrafts as souvenirs can be purchased here. Market environment neat and clean to make our guests happy in this place. To take photos of objects colorful fabric, tropical flowers, especially orchids and many others. Continue our journey towards Jati Luwih. In this place we enjoy a very broad view of the rice field with a very good drainage system. New views of rice fields planted, making a remarkable sight. 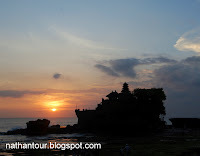 After enjoying the view of the fields considered, we continue the trip to Pura Tanah Lot. Thank you for using our service, your satisfaction is happiness for us.